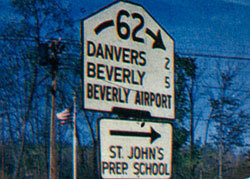 St. John's is located at 72 Spring Street in Danvers, Massachusetts. The campus has been a North Shore landmark for generations as this sign from the 1950s attests. From Route 95 South: From 95 South, take Exit 50 for Route 1 South to the Route 62 East, Danvers exit. Turn right at end of exit ramp onto Route 62 east. Follow St. John's Prep signs to Nichols Street on left. Bear right onto Spring Street. Go to top of hill to the corner of Spring and Summer streets and turn left. Follow parking signs. From Route 95 North: From Route 95 North, take Exit 49. Turn right at end of exit ramp onto Route 62 east. Follow St. John's Prep signs to Nichols Street on left. Bear right onto Spring Street. Go to top of hill to the corner of Spring and Summer streets and turn left. Follow parking signs. From Route 128 North: Take Exit 22W (Route 62, Middleton). Turn right at light onto Route 62W. Follow Route 62 for about 1.5 miles through two sets of lights. After second light, take third right onto Summer Street. Go about a half mile up Summer Street to flashing yellow light. Follow parking signs. From Route 128 South: Take Exit 22W (Route 62, Middleton). Follow Route 62 for about 1.5 miles through two sets of lights. After second light, take third right onto Summer Street. Go about a half mile up Summer Street to flashing yellow light. Follow parking signs. From Route 495: Take Route 114 East. Follow Route 114 to the center of Middleton. Turn left at Exxon gas station onto Route 62. Follow Route 62 past Route 1 and Route 95. Take first left after Route 95 overpass onto Nichols Street. Bear right onto Spring Street. Go to top of hill to the corner of Spring and Summer streets. Turn left and follow parking signs.